For raw oysters eaten on the half shell, I normally make some variation on a classic mignoette sauce: champagne vinegar, Prosecco or Champagne, shallots, fresh ground pepper. Since we picked up enough oysters yesterday for more than just one meal, I decided to make a few different sauces, so I googled "mignonette recipes" and found several that sounded interesting. 4. 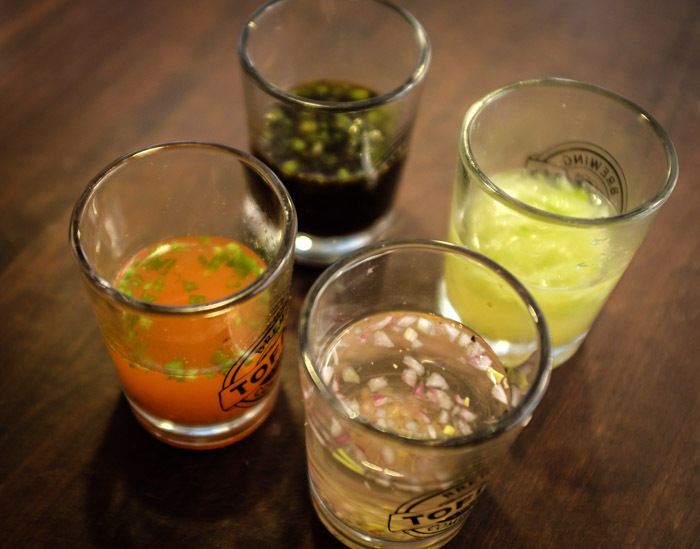 Sriracha/grapefruit/tequila/scallions/vinegar (red one on the left, another favorite). 5. The fifth sauce (not shown) was more of a relish, with minced cucumber, ginger, rice wine vinegar, shallots, and pepper. It was good, but not as good as the two favorites and the classic. We had three oysters courses last night. For the first course we smoked/grilled a few of the Shigokus on the Traeger with a bourbon chipotle butter sauce (delicious, we'll definitely be repeating this). The second course was a half dozen of the teeny tiny Olympia oysters, with the classic mignonette, and the third course was a dozen Shigokus with the variety of sauces, and a side of sauteed spinach. It was fun and delicious!